On June 10th, Silvian Cretu spoke at the Rise of the DevOps conference in Cluj-Napoca, Romania. Rise of the DevOps is a conference aimed at the growth of the DevOps community in Romania. 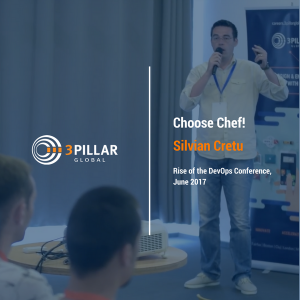 It was hosted by 3Pillar Global at the Impact Hub, Cluj-Napoca on June 10th, 2017. In the presentation, titled “Choose Chef,” Silvian began with a brief history of how SysAdmins used to rule the development world. He then highlighted the qualities of High Availability, Consistency, and Speed in Chef. Silvian described high availability as having contingency plans in place, consistency between a developer’s and a QA’s environment, and speed to scale up and down as per the requirements of the application. Afterward, he provided an overview of the Chef architecture and then held a workshop titled “Cooking with Chef in Amazon AWS.”. At the end of the presentation, a brief Q&A session was held. Silvian is a DevOps Engineer and Technical Operations Lead – Manager at 3Pillar Global. With more than 15 years of experience in this field, he’s currently leading a sysadmin/DevOps team that manages, maintains and improves an infrastructure that is built on Linux with Python, PHP, and Perl and is hosted on more than 800 instances in Amazon AWS. He uses Chef and tools alike to automate provisioning, deployments, scaling and so on.